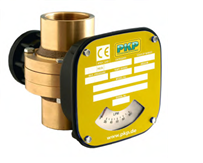 The DK10 Series Flap Flow Meter comprises a spring-loaded flap mounted in a hemispherical chamber. The flap is deflected by the flow in the line. The deflection is directly proportional to the flow rate. The movement of the flap is transmitted via a shaft – that is sealed off from the process – to a mechanical pointer and the flow is displayed on a scale. One or two microswitches for flow monitoring or an analog output module can be installed in the display enclosure (optional). Each flow meter is calibrated for the liquid being monitored based on customer specifications. The devices are available with G or NPT threads for 1/4″ to 2″ pipes and as a wafer for mounting between two DIN or ANSI flanges on DN80 (3″) to DN200 (8″) pipe sizes.